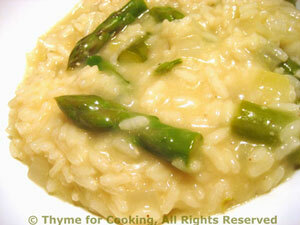 Thyme for Cooking's Main Courses: Salmon, Stuffed Pork, Asparagus Risotto. This is a simple glaze that thickens and clears as it bakes. The slightly hot, slightly salty flavor pairs well with sweet salmon. Put soy sauce, cornstarch, ginger, garlic and sherry in small bowl and whisk well. Spoon half of the glaze over the salmon. Bake in 400F (200C) oven for 15 - 20 minutes, depending on thickness. Salmon will be done when it flakes easily, slightly pink in the center is fine. 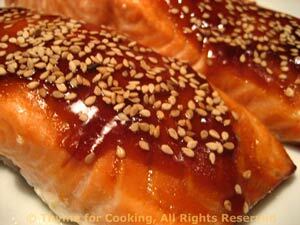 When salmon is almost done (or done) spoon the rest of the glaze over and bake for 2 - 3 minutes longer. Remove, sprinkle with sesame seeds and serve. Put them into a dry, nonstick skillet over medium heat. Toss or stir them about in the pan until lightly golden, 2 - 4 minutes. 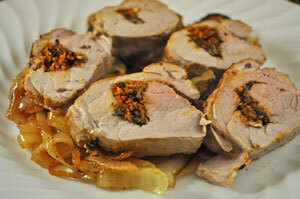 Pork tenderloin lend itself very well to stuffing. Here we stuff it with savory mushrooms and roast it on a bed of onions. The stuffing: Chop mushrooms and mince or crush garlic. Heat 1 tbs olive oil in small skillet over medium heat. Add paprika and sauté for 1 minute. Add mushrooms and garlic and sauté for 3 - 4 minutes, until starting to brown and soften. 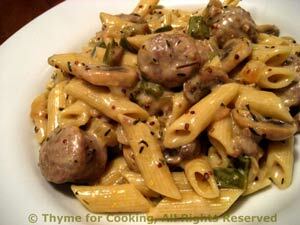 When mushrooms are done put into a small bowl and add bread crumbs and basil; mix well. The pork: Butterfly pork tenderloin - cut it in half lengthwise leaving 1/4 inch intact along the edge, so that you can open it like a book. Open it and give it a couple of whacks with a meat mallet so that it lies flattish... or pound lightly with the edge of a plate. You just want it to be flat and easy to work with. Spread mushroom mixture on one side of pork about 1/8 inch from the edge. Fold other side over and tie with kitchen string. Cut five 6 inch lengths of string and wrap around pork and tie every 2 inches - making certain that you do one as close to each end as possible. Heat butter in a nonstick skillet over medium-high heat. Add onions and sauté until tender, about 5 minutes. Add vinegar and brown sugar. Stir well to melt sugar and combine. Spoon onions into a small roasting pan, arranging so pork will just fit on top. The rest: In a small bowl whisk together remaining 2 tbs olive oil and vinegar. Place pork on onions and roast in 400F (200C) oven for 30 - 40 minutes, depending on size, until done, basting periodically with oil/vinegar mixture. When done, slice and serve. It is done when 'juices run clear', so - either poke it, slice it and take a peak or, best method, use a meat thermometer. Pork is done when internal temperature reaches 155F. A pasta dish with a Greek twist - feta cheese and dry-cured black Greek Olives, plus peppers, garlic and onions. Slice the pepper into matchsticks then cut in half. Chop the onion and mince the garlic. Cut chicken into bite-size pieces. Pit olives, if needed and cut in half. If using fresh spinach, pick through leaves, discarding any that are damaged or wilted, and tearing any that are huge. In a large skillet heat oil. Sauté paprika in hot oil for 1 minute. Add onion, pepper and garlic, sauté for 5 minutes. Add chicken and sauté until cooked through. Add wine, herbs, tomatoes and spinach, if using frozen, and cook, uncovered until spinach is thawed and sauce has reduced and thickened slightly. 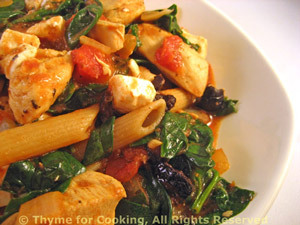 Add spinach, if using fresh, olives, feta and cooked, drained pasta. Toss to combine and heat through. Sprinkle with Parmesan and serve. Note: To pit olives, place them on a flat surface, place the flat of a large knife on top and hit with the base of your hand. This will crack and flatten the olive. Pick the pit out. 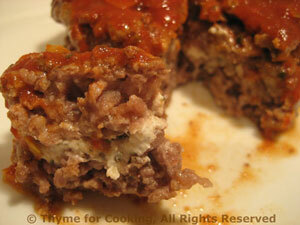 A bit of creamy goat cheese in the center keeps these burgers very moist and adds a lovely flavor. In a small bowl mix basil, bread crumbs, garlic and chevre. Make 4 patties of the beef. Spread half of the goat cheese/crumb mix on each of 2 patties, spreading to within 1/3" (1cm) of the edge. Place remaining 2 patties on top. Work edges to seal. Heat oil in nonstick skillet. Add patties and fry, 5 - 8 minutes per side, depending on thickness. In a small bowl mix ketchup, Worcestershire and mustard. Spread on top of the burgers after turning. When done, remove and serve. Mustard and yogurt make a wonderful, slightly hot, slightly tart sauce that works well with sausages. Use hot, spicy sausages if you can get them. Slice raw sausages into bite-size lengths. Heat oil over medium heat in nonstick skillet. Add onions and peppers and sauté 3 minutes. Add garlic and mushrooms and sauté 3 minutes longer. Add sausages and sauté until almost cooked through, 5 - 8 minutes, depending on size. Add herbs, mustards, wine and stock. Reduce heat to low, cover and simmer 5 - 10 minutes. Stir cornstarch mixture into sauce to thicken. You may not need all of it but sauce should be quite thick. Stir in yogurt and add drained pasta. Toss to combine and serve.